Halloween Horror Nights at Universal Studios Hollywood will resurrect AMC’s The Walking Dead this October. 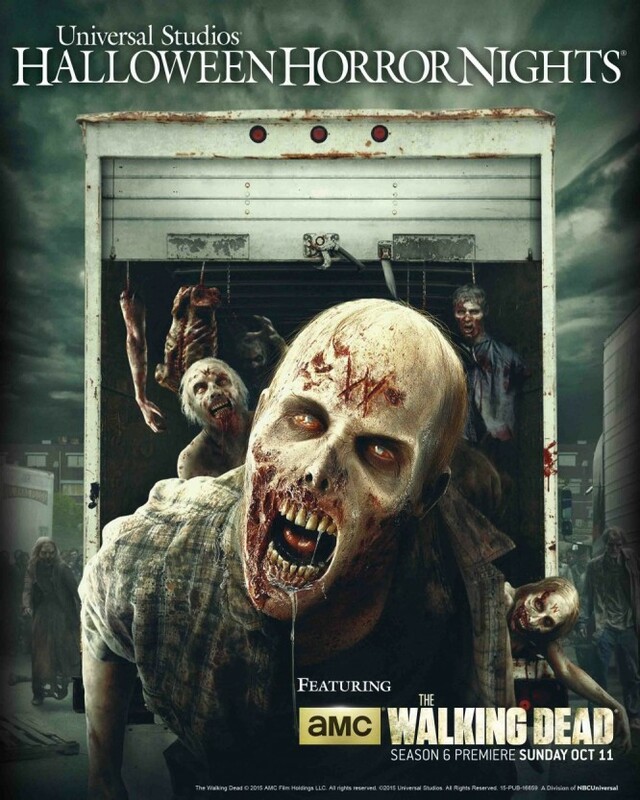 Inspired by Season 5 of the AMC television series, the new attraction will begin at the Terminus safe-haven compound, then proceed through ever greater scenes of chaos as guests are overwhelmed by the living dead, before reaching the loading dock of the Del Arno Food warehouse - where humans may be what's on the menu. The Walking Dead has become a virtual perennial at Halloween Horror Nights, inspiring mazes, scare zones, and the back lot tram tour. For Halloween 2015, HHN Creative Director John Murdy promises "the longest and scariest Walking Dead maze ever!" The Walking Dead will also invade Halloween Horror Nights at the Universal Orlando Resort. Universal City, Ca., Orlando, Fla., July 30, 2015 — The nation’s insatiable appetite for AMC’s “The Walking Dead” will continue to terrify Universal Studios Hollywood and Universal Orlando Resort when the most intense moments from season 5 of the critically-acclaimed, Emmy Award®-winning television series take a bite out of “Halloween Horror Nights,” beginning Friday, September 18, 2015. Universal Orlando’s “The Walking Dead” maze will feature hordes of walkers and eerily recreate the scenes, settings and terror that guests have seen on their TV screens. The twisted minds of Universal Orlando’s Halloween Horror Nights team are using first-ever tactics to bring the horror of season 5 to life in this year’s maze – even placing guests in the iconic flooded food bank scene where they’ll be surrounded by hundreds of gallons of water as flesh-hungry walkers attack. Universal’s “Halloween Horror Nights” is the ultimate in extreme Halloween events. For more than 20 years, guests from around the world have visited “Halloween Horror Nights” in Orlando and Hollywood to become victims of their own horror movie. Multiple movie-quality haunted houses are constructed throughout the event, inspired by iconic slasher films, hit horror movies and television series or hauntingly real original stories.Numerous scare zones also infiltrate “Halloween Horror Nights,” designed to provoke an unrelenting sense of fear and terrorize guests as they navigate the darkness from one frightening maze to another. Additional details about Universal’s “Halloween Horror Nights” will be revealed soon. For more information about “Halloween Horror Nights” at Universal Studios Hollywood or Universal Orlando Resort, visit www.HalloweenHorrorNights.com.